Because it’s pretty darn cool. Slip stitch crochet is, simply put, crocheting made up entirely of slip stitches. I read up on the technique over on David Burchall’s blog. He’s done a lot of work with it. I’ve got a few ideas myself that I’m interested in pursuing, but I took notes on the hat I’m wearing in that picture. Interested? Row 1: Beginning with Q hook, ch 15. Working in the back loop only, sl st in first ch and each across. (15 sts) Turn. Row 2: Do not ch. iF in each st across. Turn. Row 3: Do not ch. Working in back loop only, sl st across. Turn. To join, sl st last row and starting ch together as follows. Hold working yarn between the edges – behind last row but in front of starting ch. Insert hook through back loop of last row, front to back. Swing hook over yarn (it stays down in the middle), and insert from back to front of starting ch. Catch yarn with hook and pull through all loops on hook. Repeat across. Switch to N hook. To gather top: Ch 1, *[insert hook (front to back) in next ‘V’, pull up loop] 3 times. Yarn over, pull through all loops on hook. Rep from * around. (If you have two Vs left over, do it with two; if you have one do a single crochet.) Finish off, leaving a tail of yarn. Weave tail through the stitches of the gathering row and pull tight. 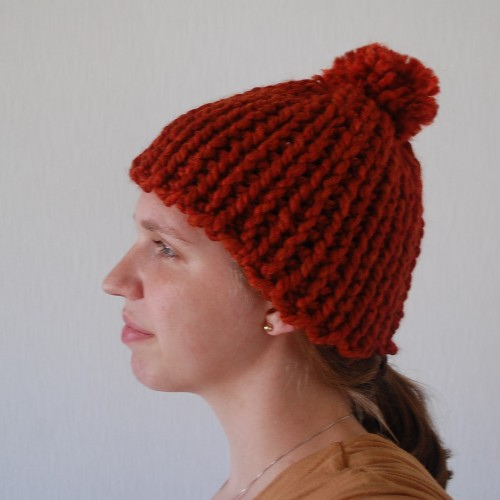 With remaining yarn and four fingers, make a pom pom (tutorial here) and sew to top. Weave in ends. Enjoy your hat! I will have to find a Q hook so I can try this! Cool! Thanks for writing it up. Never heard of it but now I think I may have to give it a try. I have heard of it, but not with this name… working in the back loop only is not really slip stitch crochet, slip stitch coechet may or may not involve working arounf the post, in both loops or in back loops only. It is quite cumbersome to crochet but the result is worth it! I would like to draw a distinction though between what David (and I) do – which is a soft, stretchy knit-like fabric composed entirely in slip stitch and “bosnian crochet” (sometimes called sheperd’s knitting). The type of slip stitch your hat is done in is worked back and forth… because you’re always working in the back loop of the slip stitch, the work ends up sort of… accordian shaped. Bosnian is by tradition ALWAYS worked in the round – that means in one direction only. Because there is no back and forth work, the “accordian” effect never happens. That’s why Bosnian is very stiff, rigid and inflexible. Bosnian is great for a stiff jacket – like a jean jacket – or a tote bag. Many hats are worked in bosnian. Flat worked slip stitching (that is “back and forth”) which includes the David Burchall style work with inverse stitches is great for soft, stretchy, lightweight toques, sweaters, and such. A really big difference, actually. ………… and a GORGEOUS hat, btw!!! I haven’t ever done slip stitching before but I have a good friend that’s going through chemo. Your hat looks like just the thing for her! I’ll give it a try. Thanks for sharing it. Great blog, love your site! I would like to know, what kind of vitamins you take, and what kind of diet are you in. I do not have any kids, (all grown) and I do not do what you do. How do you manage to do this? I would like to know, how to be more organized. I really wish I could be more organized! I’m sure I would get so much more done if I were. I don’t take vitamins either, I just try to eat a lot of whole foods including meat, eggs, butter, and bone broths…also possibly a lot more chocolate than is healthy for anyone. I was looking for a tutorial on how to make a pom pom. The one on this site is dead. Anyway I love to crichet and knit. I have a website that is a work in progress where I want to start selling my work. The slip stitch is a versatile stitch. I use it alot. im just hoping there is a video I can watch because I learn hands on and would like to make simple hats with ball on top please help thank you/ deb.